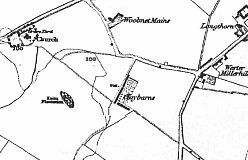 Claybarns was a small village or hamlet of houses inhabited mainly by colliers. 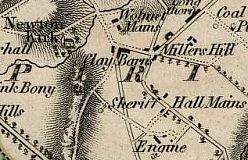 It appears on Roy’s Map of Scotland compiled between 1747-1755 but had totally vanished by the late 19th century. 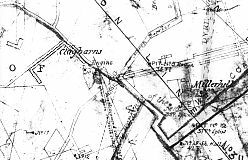 In 1808 when the nearby Sheriffhall colliery was leased by Hope of Craighall, a condition of the lease was that Hope could not build any more houses for the colliers except at Claybarns so this probably helped it grow quite large. In 1846 the village had 186 inhabitants, but by the late 1840's work at Sheriffhall Colliery had finished and it went into decline from that point. 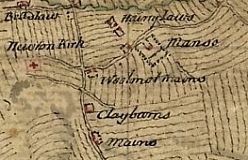 James Knox's map shows Claybarns shortly before it grew to accomodate more colliers as Sheriffhall Colliery expanded..
Only part of Claybarns still existed by the time of the first Ordnance Survey Map. 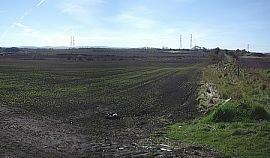 The photo is taken from the position of the most northerly part of Claybarns looking south. No trace remains of Claybarns itself except for the track or path to the right which used to run in front of the houses. It's position is shown below on a modern OS plan.